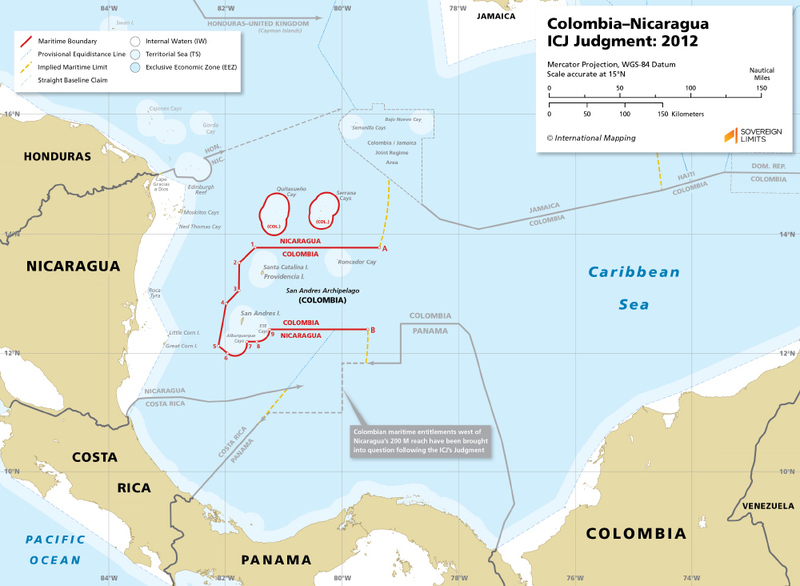 The maritime boundary between Nicaragua and the Colombian islands of the San Andrés Archipelago was established by a Judgment handed down by the ICJ in 2012. While the Court employed several boundary delimitation methodologies in constructing this line, the main section that divided the western reach of Colombia’s islands from the maritime entitlements of Nicaragua’s mainland was a modified and then simplified equidistance line, extending from points 1 through 5. Both full and semi-enclaving segments, along with lines of latitude, were also used to complete the boundary. The 200 nautical mile reach of Nicaragua was used to frame out the eastern limit for their ruling, but it was not incorporated into the 2012 Judgment. This appears to have left unanswered Nicaragua’s claim to an extended continental shelf entitlement east of the San Andrés Archipelago. 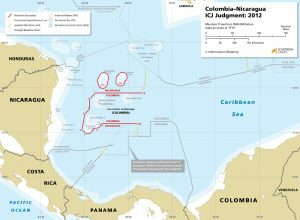 In 2013, Nicaragua submitted new proceedings to the ICJ concerning the delimitation of the continental shelf and alleged Colombian violations of Nicaraguan sovereignty in maritime space that was allocated to Nicaragua in the 2012 Judgment. The Court is currently hearing these cases.